A North Wales race relations campaigner has written his autobiography describing his struggle with racism in Britain. The campaigner Enrico Stennett, 81, originally from Jamaica but living in Penmaenmawr, works for North Wales Race Equality Network. His father was of mixed race, and died before he was born, and his mother was white. His book is called White Master’s Child, or Buckra Massa Pickney in Jamaican patois. He was born in Montego Bay, Jamaica, and arrived in the UK in 1947 aged 19. Within months he became a member of the League for Coloured People. In 1950, with his British wife Margaret, he founded the Cosmopolitan Social Society with his Jewish friend, Stanley Freeman. That organisation became defunct in 1952 when Stennett and others founded the African League. 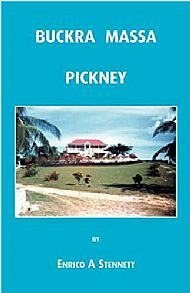 In his colourful autobiography, Buckra Mass Pickney, Enrico writes, "My argument was that I was not running away from anybody. I intended to stay and fight for what I believe was right, and I was determined to be a messenger and spread the news of our suffering in any way I could ... It was the dream of a young inexperienced man, who believed he could change the world. In my twilight years, I now realise the naïvety of my thinking."